Although it is Mississippi's largest city, and the state capital, Jackson has a slow pace and a distinctly southern lifestyle. Its population of about 167 000 is spread over a large geographic area, making it seem smaller than it is. 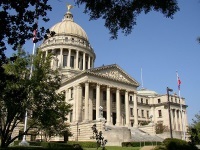 The main landmark in the city is the old Mississippi State Capitol building in the very centre of the downtown area. Jackson meanders along the banks of the winding Pearl River, having been founded in 1821 as a trading post. It is an exceedingly well-ordered city thanks to thoughtful town planning, but because it is spread out, exploring its distinct neighbourhoods is best done by car. Cultural centres, historic buildings and museums are located downtown, but visitors need to travel to areas like Ridgeland, a few miles out, to find good shopping, eating, lodging and nightlife opportunities. The neighbourhood of Mid North has some great recreational areas, like Le Fleur's Bluff State Park, while to the west of Downtown is the significant Farish Street Historic District, a centre of black culture, politics, religion and business.